It’s rare that we have a super fight in women’s boxing. It is even more rare that we have one that lives up to the billing. 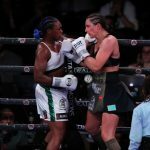 The post Claressa Shields Becomes Undisputed Champion as She Defeats Christina Hammer appeared first on Round By Round Boxing.